The University of Manchester has nearly £10m invested in fossil fuel companies, despite priding itself on being the first English Russell Group university to join the United Nation’s Principles for Responsible Investment (PRI). Freedom of Information (FOI) requests submitted by The Mancunion reveal the University had £9.9m invested in shares in fossil fuel companies in the year to April 2018. The portfolio included shares in BG Group, BP, Royal Dutch Shell, Imperial Oil, REPSOL, Rio Tinto, and Exxon Mobil. Whilst the investment may be impacted by fluctuations in share prices, the total value has nevertheless nearly doubled from just over £5m in April 2017. The University publicly commits to investing only in companies which have “acceptable standards of ethical or environmental practices”. Despite having such a commitment in place for over a year now, according to the University’s investment portfolio, it has not yet invested in any companies that focus solely on renewable energy, or environmentally sustainable practices. Last month, leading climate scientists warned that there was just twelve years left to save the world from a climate catastrophe. 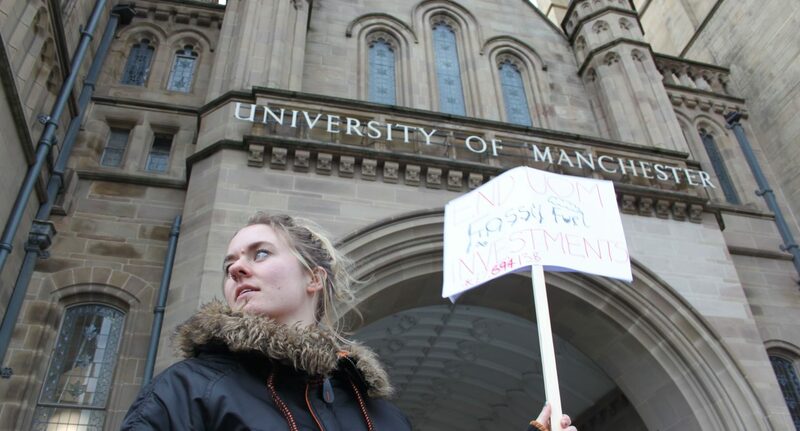 A University of Manchester spokesperson said: “As a result [of the PRI], the University’s investment managers have incorporated environmental, social, and governance factors into their decision-making. The value of these investments represented 1% of total University income in 2016/17, with the £423.9m earned from tuition fees making up 45% of total income. Campaign group People and Planet ranks British universities on their attempts to move away from fossil fuels. It says the University has made no efforts to divest while institutions like Durham, Leeds, and Bath, have all moved investments away from fossil fuels. People and Planet held a demonstration on November 21, calling on the University to, “actually follow its plans surrounding social responsibility” and stop “actively funding the destruction of the planet”. English Literature and the History of Science, Technology and Medicine student Hana Jafar believed the University should not be making investments in such firms “because the University claims to be socially responsible”. She said: “It is ironic that a University that has invested in world class research on science, technology, and innovation fails to see a fundamental error in judgement in their unethical and unjustifiable investments. If I had known how unethical our University’s investments are, I wouldn’t have chosen to study here and put £15,500 into this institution every year”. Lily Shepard, President of the Manchester Energy and Environment Society, said: “Last year, the Carbon Majors Report by the Carbon Disclosure Project stated that just 100 companies are responsible for 71% of global emissions. The Manchester City Council Executive recently aimed for the city to become zero carbon by 2038 — one of the most ambitious targets seen in Europe and around the world. The target was made in line with research from the Tyndall Centre, which is based at the University of Manchester.